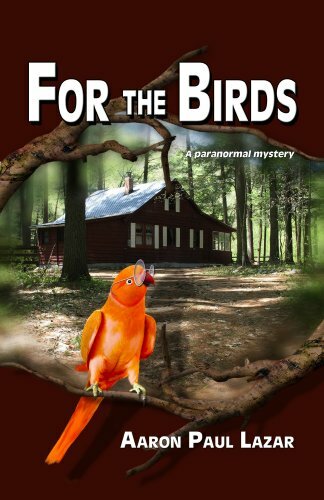 What happens when a parakeet named Ruby gets an unexpected mind-meld with Marcella Hollister's quarrelsome mother, Thelma? After Thelma is kidnapped from her hospital bed, Marcella must find her -- somewhere in the tall pines of the six-million-acre Adirondack Park. With the help of her Native American husband Quinn and bizarre "tips" from Ruby, Marcella butts heads with quirky bird psychic Earl Tiramisu, much to the chagrin of the FBI, who wants her to stay out of the investigation. 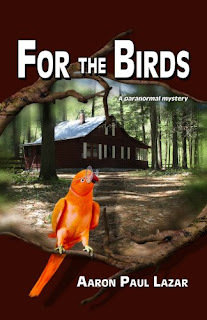 "I had the privilege to read the most delightful mystery, For the Birds, by Aaron Paul Lazar. If I had to categorize it, I'd call it a cozy with an unusual supernatural touch, but in all honestly, it was one of the most unique and refreshing mysteries I've read in a long time--with a huge surprise ending." Marilyn Meredith, (as F. M. Meredith) author of Angel Lost. Looking for a mystery that seems perfect for a Christmas present? This is the book for you. As unusual as it sounds, this book was not one of those dark, depressing, overly suspenseful mysteries...instead, this book was a little touching. The characters, for the most part, were fun to get to know and likable. Of course, this book does have plenty of exciting parts. There is murder, kidnapping, and evil characters. The reader will learn to hate these antagonists that are causing so much trouble. However, the characters who are antagonists are not as clear cut as they may seem. The reader will have to see through the fog and pick out who he/she believes are the antagonists and who are the protagonists. This book has plenty of twists and surprises. It will be hard for the reader to be bored. This book was mixed with action and serenity. It is hard to imagine a mystery taking place anywhere other than a big city or foreign country; however, the combination of a quiet, benign woods and mountains with the gruesome murder actually makes for an exciting setting. The reader will be able to enjoy the author's attention to detail as well as the fast-paced mystery. This book is recommended to young adult/adult readers.